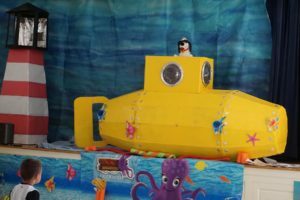 For more than 20 years, a creative team at St. John’s Lutheran Church in Phoenixville has been going over the top with elaborate sets and props for the congregation’s annual Vacation Bible School. “We try to take the theme of the year and make it bigger than life,” says Bobbie, one of the core members of the team. 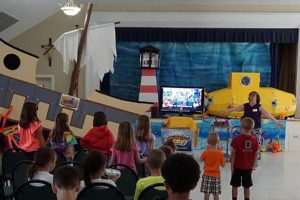 Last year the team was tweaking set pieces for their Deep Sea Discovery the night before VBS opened, when one of the members said, “we need to build a lighthouse.” And they did — on time, says the Rev. Stacey-Kyle Rea, pastor for youth and family ministries at St. John’s. “It’s just fun and rewarding to hear the kids go “Wow!” when they come in,” says Barb, the creative spark of the team. For years the scenery and props were on St. John’s main stage for a week, and then ended up recycled or in the trash, Rea says. Now the set pieces are making cameo appearances at churches across the synod. It all started in 2016 when Rea had a conversation with a friend, the Rev. Deborah Wolfe, pastor of St. Timothy’s in Fox Chase. 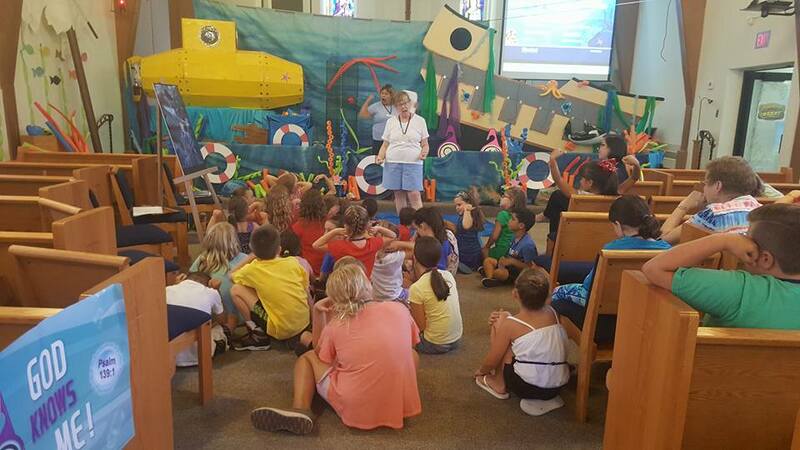 St. John’s had materials for their VBS, which draws nearly 50 children in the predominantly Catholic neighborhood. “We just don’t have the people power to make any of these props,” says Wolfe. So the colleagues in ministry hatched the idea of sending over the scenery St. John’s had used earlier in the summer. “They gave us a beautiful set” for the G-Force curriculum, Wolfe says. But before St. Tim’s could use it, the word got out and the set made a tour stop at St. Peter’s in Lafayette Hill. Similarly, the Deep Sea Discovery items stopped at Augustus, Trappe on it’s way to Wolfe’s congregation this summer. This summer’s creations will also be making appearances at congregations near you. “There was a time when churches would worry about competition with each other,” Rea says. “We like to think more as a creative commons” (a reference to the share-and-share-alike alternative to copyright adopted by some content creators). Resurrecting the VBS sets also excite their creators. “It makes us feel really good that, not only do we have a wonderful program at our church, but the themes we create live on,” says Bobbie. As the sets have traveled across the synod, they have also have had gigs at St. John’s in Mayfair; St. Paul’s, Glenside; Prince of Peace in the Northeast; and Temple, Havertown. And they could appear at your church. Rea is happy to expand the circle of sharing. Interested in using one of St. John’s VBS sets? Contact Pastor Stacey-Kyle Rea at pastorskrea@gmail.com. Photos: The Deep Sea Discovery set in use at St. Timothy’s Lutheran Church in Fox Chase and Augustus, Trappe.